Sunwatch at Sugar Hill is perfect for families with kids! Besides the usual TV and media equipment, you’ll also find a pool that pours into a Jacuzzi, boards and book games, and a beach just five minutes away. While the kids splash around, you can barbecue on the back patio and whip up some exotic island drinks at the bar while enjoying the sun setting over the sea. 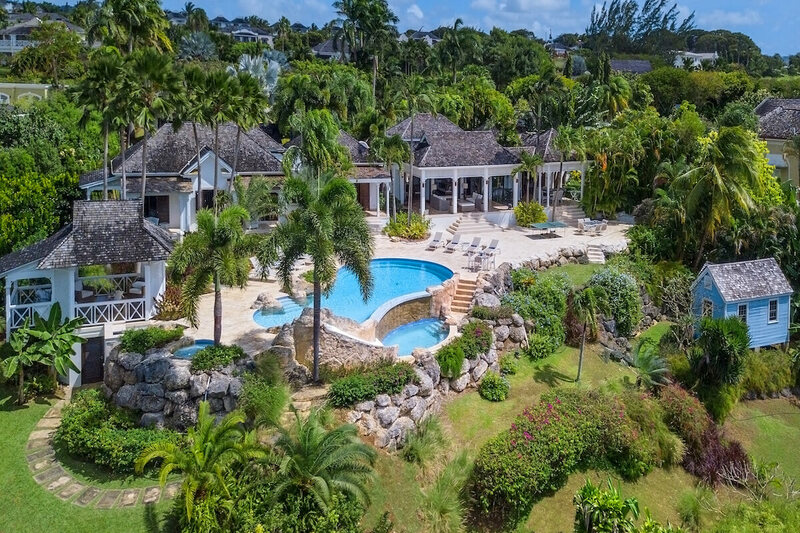 Sunwatch At Sugar Hill sits on two lushly landscaped acres atop a ridge on Barbados’ West Coast. Guests can enjoy unobstructed views, serenity, and a full staff including a cook, a laundress, and housekeepers. Sugar Hill’s on-site facilities include an open-plan clubhouse with a restaurant and bar, four tennis courts with flood lighting, an air-conditioned gym, a 2,000 sq ft swimming pool, and a members’ lounge. The beach is five minutes away, yet the villa’s outdoor lounge still feels private. Sunwatch’s expansive covered veranda and pool terrace combine to create a tropical oasis. Comfortable sun loungers and palm trees surround a freeform, infinity-edge pool, and there’s also a Jacuzzi with a wet bar to take moonlit cocktail hours to the next level. There’s also a dining terrace right outside the kitchen. The villa features high, vaulted ceilings and a spacious open-concept design. Modern amenities include a flatscreen TV, WiFi, a bluetooth speaker, and a sound system. The air-conditioned family room also features books, board games, and a bathroom. The kitchen is well-equipped with stainless steel appliances, a sleek prep counter, a butlers pantry, and a powder room. There are two luxurious master bedrooms and two guest bedrooms in the main house, and all four have ensuite bathrooms, air-conditioning, and spacious patios. There is also a detached, two-bedroom cottage on the grounds that’s perfect for older children, couples, or in-laws. The cottage also has a bathroom and a kitchen. Sunwatch At Sugar Hill provides membership to the Fairmont Royal Pavilion Beach Club, water sports, beach restaurants, and beach bar service. Sugar Hill is also near Speightstown and Holetown’s banks, shops, and restaurants. Beach facilities for Sugar Hill residents at Suga Suga, Mullins, St. Peter. Approximately 5-minutes drive to beach. Transfers are not included, but can be arranged upon request. Guests have access to the Sugar Hill Beach Facility located at The Fairmont Royal Pavilion Hotel. During Winter and Christmas Butler service is included.